or: Style waaaaaaaaaaaaaaay over substance. One word to sum it up: Lighty. There are some things in life one may regret. You know, like, losing something important or crashing into a tree. I regret that my first 3D experience was TRON: Legacy. It could have been Avatar...it could have been bloody Yogi Bear for all I cared (okay, maybe that's pushing it too far), but no, it was Tron. Just so you know, I didn't hate the film...and I almost gave it a 6/10 rating. But thinking about it now, I'm wondering if it really deserved that kind of rating. Sure, it was pretty (I'm not sure which parts were 3D though), but it wasn't as amazing as that trailer I saw before Inception said it would be. Sam Flynn (Garrett Hedlund), the tech-savvy 27-year-old son of Kevin Flynn (Jeff Bridges), looks into his father's disappearance and finds himself pulled into the same world of fierce programs and gladiatorial games where his father has been living for 20 years. Along with Kevin's loyal confidant (Olivia Wilde), father and son embark on a life-and-death journey across a visually-stunning cyber universe that has become far more advanced and exceedingly dangerous. Let me begin by saying this: 3D is overrated. It just seemed to enhance the picture, whereas I thought it would be more in your face. However, I think the 3D kinda improved the quality of this film. I mean, it didn't add dimensions to the story, where it was needed most, but it added dimensions to the visuals, which is what I think the filmmakers most wanted. They wanted people to be wowed by all those lights-and don't get me wrong, I was wowed-but from a critical standpoint, that wasn't enough. As long as the effects were still there, it was like the script didn't matter, and like Kevin, it seemed to get lost to the point when the audience no longer cared to find it. I think the only time I was truly jumping for the joy over this movie was when CILLIAN MURPHY APPEARED ON SCREEN. I nearly choked on my popcorn I was so excited. Alas, he was only on there for a few minutes, and it was a shame he didn't stay longer. 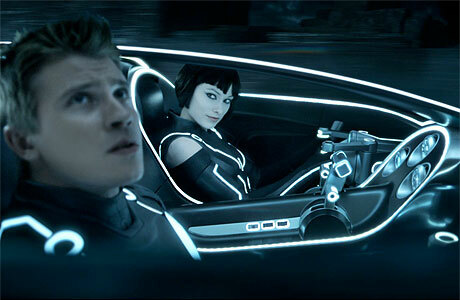 TRON: Legacy isn't as bad as the critics may lead you to believe. Sure, they get caught up on the clunky script, and rightfully so-you may even find yourself doing that too. I admit I was entralled by most of it, which no doubt had a lot to do with the brilliant score from Daft Punk. Jeff Bridges was, as always, great, even though both of the characters he played actually looked nothing like him (Clu was way too young; maybe they were trying to emphasize Flynn's age just a tad). Garrett Hedlund was just the average modern guy. Michael Sheen was, quite frankly, a little scary. But I found Olivia Wilde to be the real star of the show here. She, afterall, had the task of being the nerdy dreamgirl from a computer game, and she succeeded in that. As I said earlier, I was going to rate this movie 6/10. However, now that I've given it a little more thought, this movie really doesn't add up enough for me to think that it's still 'fresh'. It's a good blockbuster, I'll give it that, but it doesn't really stretch the limits of it's premise, or it doesn't offer any really astounding moments. Which is a shame, because it could have gone so far...it just chose to be so safe. THE VERDICT: Great visual effects and music can't detract from the really clunky script, which seems to get lost somewhere between the point of entertainment and generic over-budgeted crap.